This sketch was generated using a technique I’m starting to call (for my own convenience as much as anything) Emergent Social Positioning (ESP). The idea is basically this: grab a sample of followers of an individual (197 in the above case), then generate a graph with links from those followers to either all, or a sample of, the people they follow. 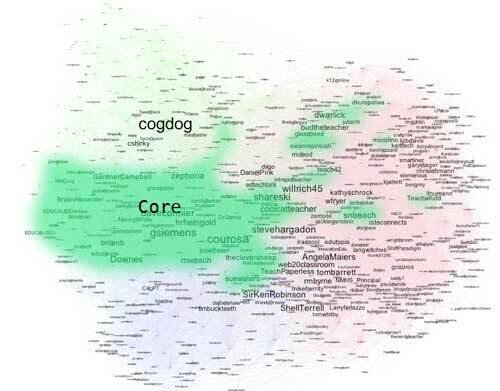 The result is a filtered graph, such as the sketch above, that shows how the original target account (the one from which we sampled the original follower list) is positioned in social space by their followers. That is, we see who else the followers of the target account follow in significant numbers. Tony wrote more detail in the caption for his original image. In visualizations, the question seems to be, is there meaning in the patterns or do we try to make meaning out of the patterns? I have been trying to qualitatively determine if the distributions make sense to me. In the following images, I merely bought the base graph into Photoshop, and did some lasso areas around groups that seemed to make sense to me. This first group jumped out first as being mostly, or all, people/organizations in K-12 education. It is also the largest area among the groupings I made; so I wonder Tony if the spread has meaning too. 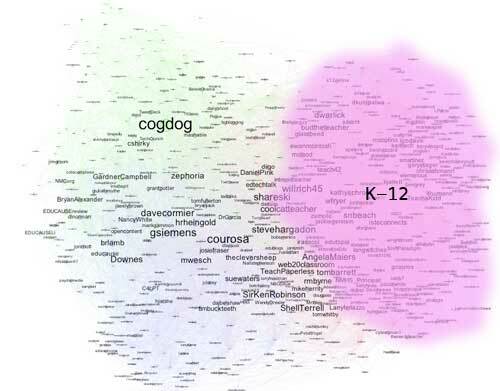 There also seems to be a variation moving east to west in this grouping, from more classroom/teaching educators to ones who support/admin/consult in the field. 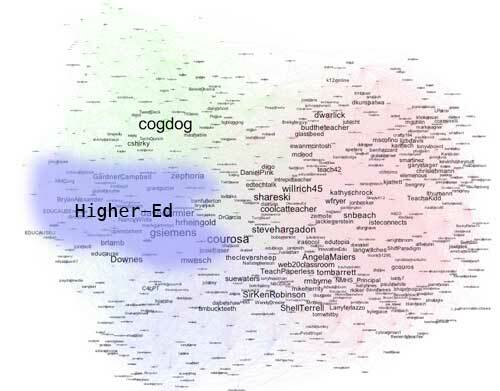 Continuing this breakdown within the field, to the west I find many of my colleagues from higher education. I am not sure if there is a similar axial relationship, although I see more organizations (NMC, EDUCAUSE) to the west edge of this region. This region is closer to my location makes sense sincde more of my work as been in higher ed. Lying south of the higher ed region are the people who do more work in learning outside of education, e.g. corporate e-learning. It is a smaller group, and the node sizes are much smaller, and farthest form my location, so they are related to my followers yes, but perhaps in a less strong way. 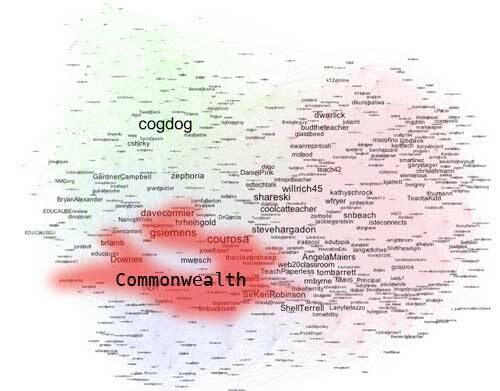 I also noticed a grouping of colleagues from the UK, but they were also in proximity to ones from Canada and Australia (I missed a number of outliers), this is the only attempt I made to isolate a geographic group, but it seems to be there. 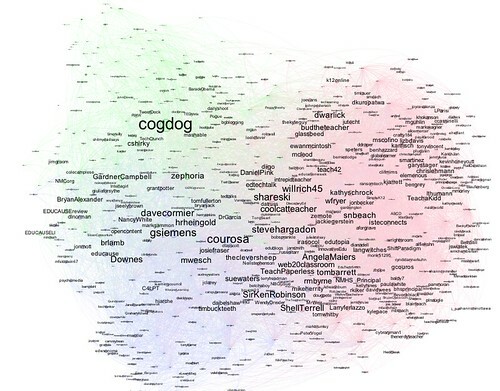 The other really obvious grouping I call my “Core” since these are people I identify with the most, or were colleagues in my previous work, and also likely communicate the most with in twitter, but I also reached out to lasso in people I have also met in person. They are proximally located to my node, and also are among the larger of the node sizes (the size of the text). The area that makes the least sense, (with the exception of @bgblogging, but Barbara is in my mind, a locus of uniqueness) are right around the location my own spot. I;’ve not come up with any grouping of these beyond “etc” (@TechCrunch to @BarackObama to @dailyShoot to @cshirky?) It’s sort of a technical other group, but I decided to leave it unclassified. Now getting back to meaning- Tony performs some magic eigenvector-mumbo-jumbo math on a large pile of data and generates this set of patterns. I can look at it and find some meaning or logic to it all. It is interesting, for sure, and makes me wonder what other ways there are to slice, dice, Julienne fry the data. On our drive today from Montreal back to the Toronto region, I read a few of these out loud to a friend as she drove. One we both enjoyed was Everyday Apophenia by David Pizarro, a Psychologist at Cornell University with the fab title of “Researcher in Moral Judgment”. Since it is short, I will include the full three paragraph essay– I find it a bit sad that the original articles lack any hypertext, maybe it is because Nicholas Carr is on board and he hates the distractions — but this is my blog not his, so I am adding some back in. The German neurologist Klaus Conrad coined the term “Apophenia” to describe this tendency in patients suffering from certain forms of mental illness. But it is increasingly clear from a variety of findings in the behavioral sciences that this tendency is not limited to ill or uneducated minds; healthy, intelligent people make similar errors on a regular basis: a superstitious athlete sees a connection between victory and a pair of socks, a parent refuses to vaccinate her child because of a perceived causal connection between inoculation and disease, a scientist sees hypothesis-confirming results in random noise, and thousands of people believe the random “shuffle” function on their music software is broken because they mistake spurious coincidence for meaningful connection. In short, the pattern-detection that is responsible for so much of our species’ success can just as easily betray us. This tendency to oversee patterns is likely an inevitable by-product of our adaptive pattern-detecting mechanisms. But the ability to acknowledge, track, and guard against this potentially dangerous tendency would be aided if the simple concept of “everyday Apophenia” were an easily accessible concept. This is a helpful reminder; this powerful skill our human brains have to see patterns, quickly, in a lot of information, is extremely useful, but it opens the question to the idea that we may see patterns that maybe do not have any real meaning. I wonder that in the flood of infographics that come our way, or the chart junk that we get on evening news. It’s not an easy thing to sort out. Why do people see faces in nature, interpret window stains as human figures, hear voices in random sounds generated by electronic devices or find conspiracies in the daily news? A proximate cause is the priming effect, in which our brain and senses are prepared to interpret stimuli according to an expected model. UFOlogists see a face on Mars. Religionists see the Virgin Mary on the side of a building. Paranormalists hear dead people speaking to them through a radio receiver. Conspiracy theorists think 9/11 was an inside job by the Bush administration. Is there a deeper ultimate cause for why people believe such weird things? There is. I call it “patternicity,” or the tendency to find meaningful patterns in meaningless noise. Pareidolia is a type of apophenia involving the perception of images or sounds in random stimuli, for example, hearing a ringing phone while taking a shower. The noise produced by the running water gives a random background from which the patterned sound of a ringing phone might be “produced”. Related examples from pop culture that I have read/seen include William Gibson’s Pattern Recognition, and the movies A Beuatiful Mind and Pi. 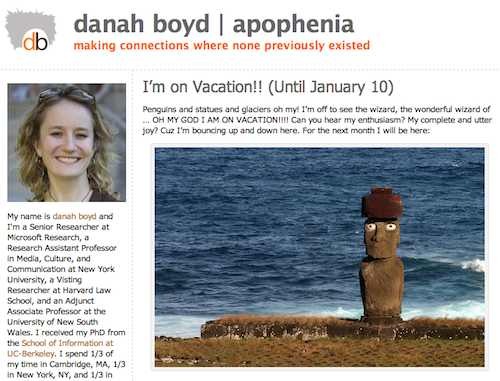 And to come full circle, I know that the word “apophenia” was familiar, since that is the blog name of someone in my Core region above, @zephoria (dana boyd) – where her tag line is “making connections where none previously existed”. A final thanks to Tony for giving me a lot of ideas to ponder.